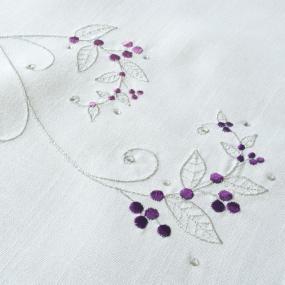 Beautiful white Christmas table runner with embroidered silver and purple berries with the addition of small clear gems. 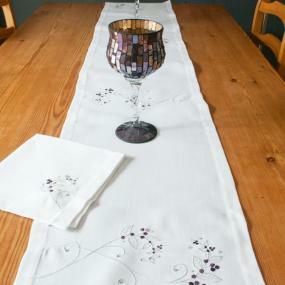 This simple but stunning table runner is from Peggy Wilkins and measures 14 x 75 inches. 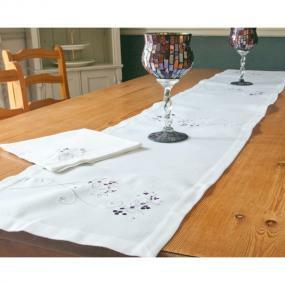 The runner is made of 100% linen feel polyester and is machine washable at 30'C on a delicate cycle. The quality is superb. Looks and feels like linen. The price is a bargain. An excellent find. Very pleased with it and was just what I was looking for.